Sunderland’s 1-1 draw with Stoke was the final Sky Sports Monday Night Football of the season and super pundit Gary Neville picked his team of the season. Last week Neville had been canvassing opinion on Twitter for the only player he was missing in his best XI of 2012/2013, the central midfielder to partner Michael Carrick. There undoubtedly appears to be some consensus in the football world this season with Neville’s side very similar to the PFA Premier League team of the year. Substitute Steven Gerrard for Eden Hazard and you have the same team! Did everyone’s favourite pundit G Nev get it right? What about the likes of Marouane Fellaini, Santi Cazorla and Michu? 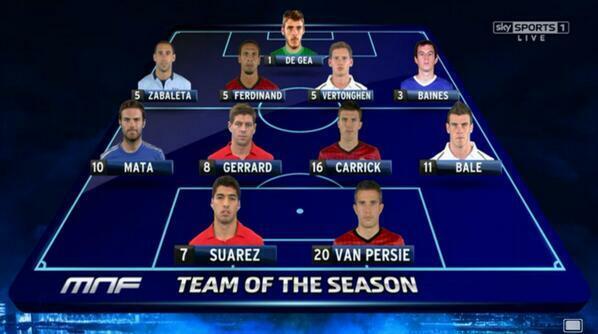 A short snippet video from Sky’s Monday Night Football on Gary Neville’s Premier League team of the season is below.